On December 12, 2008, the California Air Resources Board approved the Truck and Bus regulation to significantly reduce particulate matter and oxides of nitrogen emissions from existing diesel vehicles operating in California. This fact sheet describes the regulatory requirements for school bus PM reductions consistent with the amendments considered by the Board in December 2010. For general information about the diesel regulation, see the Truck and Bus Regulation Compliance Requirements Summary fact sheet. Diesel-fueled school buses with a Gross Vehicle Weight Rating over 14,000 pounds are subject to the regulation. Owners must retire school buses manufactured before April 1, 1977, by January 1, 2012. Remaining school buses must have particulate filters (that reduce diesel PM emissions by 85 percent) installed according to the schedule shown below in Table 1. What relief did the Board grant at the December 17, 2010, hearing? The Board delayed the initial compliance date by one year and provided an optional three year delay until 2014 for school buses with engine model years 1988-1993. Additionally, the board added credits for electric, hybrid, alternative fuel, and pilot ignition engine school buses and they also reduced the reporting requirements. How does the regulation define a school bus? School buses are vehicles providing transportation of any school pupil at or below the 12th-grade level to or from a public or private school or, to or from public or private school activities. What school buses are already in compliance with this regulation? School buses with ARB-verified Level 3 (85 percent reduction of PM) particulate filters installed or engines meeting a 0.01 grams/brake horse power-hour PM emission standard and school buses with ARB-verified Level 2 (50 percent reduction of PM) particulate filters installed on or before December 31, 2005, if that was the highest level device available at the time. What school buses are exempt from the regulation? School buses with a GVWR less than or equal to 14,000 pounds, school buses registered as historic vehicles and non diesel-fueled school buses such as compressed natural gas fueled school buses are exempt. Is there a provision for low use school buses? Yes. School buses operating less than 1,000 miles in a 12-month period are exempt from the performance requirements of the regulation; however, these vehicles are subject to recordkeeping requirements. What is required if a school bus cannot be retrofitted? A delayed compliance date of January 1, 2018, is provided for school buses that cannot be retrofitted (e.g., 2-stroke engine buses and some pre-1987 model year school buses). By January 1, 2018, these buses must be replaced if no particulate filter is available or repowered with an engine on which a particulate filter can be installed. Recordkeeping and reporting requirements apply until the school bus is brought into compliance. Reporting is required when the owner of the fleet chooses to use the “Extension of Deadline for Unavailability of Verified Diesel Emission Control Strategy,” which applies to buses on which a PM filter cannot be installed. The reporting requirements apply on January 31 of each compliance year through January 31, 2017. These buses are also subject to recordkeeping requirements. Are there credits for fleets that have downsized? Yes, there are credits for downsized fleets until January 1, 2014. A fleet that decreases their number of regulated school buses may reduce the percent requirement in Table 1 by the same percentage that the fleet has downsized since 2006. For example, a fleet that is 20 percent smaller than it was in 2006 would subtract 20 percent from the annual compliance requirement. If the compliance requirement for the year is 33 percent, the fleet would need to demonstrate that it had PM filters on 13 percent of the existing fleet (33 percent - 20 percent = 13 percent). All school buses in the 2006 baseline fleet and in the fleet on January 1st of the compliance year are subject to the recordkeeping requirements. Are there credits for fleets with alternative-fuel vehicles? Yes. Fleets with electric, hybrid, alternative fuel or pilot ignition engine school buses with a GVWR greater than 14,000 pounds shall receive a credit to treat a diesel school bus as compliant until January 1, 2014. When is a California Highway Patrol safety inspection required? The CHP safety inspection is required after a PM filter is installed and before the school bus returns to service. How have retrofits on school buses performed? Retrofit PM filters have proven to be a cost-effective option for school buses. Thousands of filters have already been installed on school buses throughout the state, with fewer than one percent exhibiting issues. When issues have arisen, PM filter manufacturers have worked with fleets to resolve them. How are retrofits a cost-effective approach for reducing PM emissions? Approximately seven school buses can be retrofitted for the same amount of money as one new school bus replacement. A PM filter costs less than a new bus even when considering the added cost of infrastructure and electricity. Also, fleets will incur maintenance costs regardless of whether an aftermarket filter or an original engine manufacturer filter is installed on the school bus. 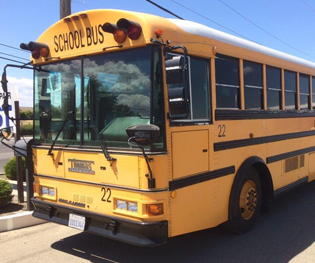 The Lower-Emission School Bus Program provides limited financial incentives of up to $20,000 per bus to install diesel PM filters and up to $140,000 per bus to help replace high-emitting pre-1987 model year buses (match funding is required to replace 1977-1986 model year buses) to reduce toxic PM emissions. The use of fully-funded diesel PM filters substantially reduces school children’s exposure to toxic diesel PM and is the least expensive compliance option. This funding does not cover the cost of a typical hybrid school bus. The Hybrid Truck and Bus Voucher Incentive program permits combining funds from the Lower-Emission School Bus Program to finance up to the full cost of a new hybrid school bus. Additionally, many local air districts collect motor vehicle registration fees and other funds which may be used to replace or retrofit school buses. Information about the LESB program is located at www.arb.ca.gov/bonds/schoolbus/schoolbus.htm. Fact sheets, compliance tools and regulatory documents are available at www.arb.ca.gov/dieseltruck or by calling ARB’s diesel hotline at (866) 6DIESEL (634-3735). To obtain this document in an alternative format or language please contact the ARB’s Helpline at (800) 242-4450 or at helpline@arb.ca.gov . TTY/TDD/ Speech to Speech users may dial 711 for the California Relay Service.